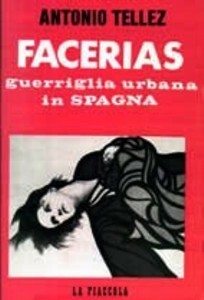 Many anarchists have struggled and are still struggling today with the same irreducible spirit of counter-position that characterised the life of Facerias or Sabate or the thousand other guerilla fighters who fell while continuing the armed struggle against Francoism even after the fall of the Republic. And for many of them other books could have been written, dedicated not so much to a method or revolutionary position as to the will of the individual who insurges when everyone else keeps quiet fearfully awaiting signs of better days to come. Yet this first aspect of the question does not seem enough to me. Or rather, to tell the truth, it no longer seems to me to be enough. There was a time, twenty years ago, when what we could call the primary, essential analysis i.e. the analysis aimed at underlining the great courage of the actions and proposing them as examples to be followed seemed to me to be sufficient. I am now convinced that this preliminary aspect is no longer enough. One would run the of risk of falling into adulation. We need to say more today. Not so much about the responsibility of those who indirectly favoured repression by putting obstacles in the way of the revolutionary work of comrades such as Facerias in favour of political perspectives which defended the line of parties or the remainders of the conventicles of resistance; so much as concerning the very concept of antifascism and its retarding effect on the revolutionary struggle, and which was open to interpretation in a way that made it difficult to use clearly in an anarchist perspective of the destruction of power. The Spanish civil war and the inheritance that its tragedy left the European and world political left, certainly did not create the ideal atmosphere for clarifying such problems. Antifascism seemed, and continued to seem for decades to come, the common ground upon which to base revolutionary collaboration. The anarchist organisations which supported the activity of Facerias or Sabate abroad — because the problems were the same for these two comrades as for many others — also, and I would say essentially, had an antifascist perspective, one that was to give life to a counter-position capable of programming the return of the Republic to Spain. So they could support the actions of comrades who went into Spain to foment revolt, but they could not in any way support the actions of these comrades when they took place in situations such as those in France or Itay, where by definition fascism was not in power. Two kinds of problem derived from this strange concept of revolutionary struggle as intended by the institutional organisations of Spanish anarchism abroad and the considerable number of non Spanish organisations with positions similar to those of anarcho-syndicalism, both fraught with incomprehension and equivocation. In the first place the call for a generic collaboration in the name of anti-fascism, regardless of any proper analysis of the positions proposing intervention in the struggle. In fact, the positions of Facerias and Sabate were never object of serious examination, no discussion or debate ever took place. And Facerias himself never went beyond a generic desire to see all the groups that did not share the positions of the Spanish FAI or the CNT organised federatively . Secondly, the same generic and unclear agreement justified isolation and boycotting when their initiatives threatened to extend beyond Spanish fascism labelled as francoism, and strike any State structure, in that any State is an enemy for the exploited, fascist or not as its constitution might be. And if the struggle were to continue, this could count on the autonomous decisions of the few comrades who wanted to carry on and who found themselves obliged to face and resolve all the problems that arose without any external support, when they did not find themselves faced with an actual web of slander and obstacles put in their way. In such cases there are two kinds of problem to be faced. Whoever finds themselves fighting almost alone has to face the problem of self-financing their struggle. And this can only be faced by going and taking money from where it is to be found, usually in banks or in jewellers’ shops. In order to resolve this let us say instrumental aspect one must give oneself a technical apparatus which is the same as that usually used in the struggle against objectives of a more declaredly and easily identifiable political qualification. And there are not a few cases where the two problems became intermingled like a snake uselessly trying to bite its own tail. Self-financing was aimed at supplying oneself with means for the struggle. But at times this became so complicated as to run the risk of becoming the aim of the struggle and no longer just one of the means. If to this we add the fact that, isolated from a real mass movement one was obliged to think of everything, up to the smallest move, safe houses, procuring arms, etc, one can get an idea of the gigantic efforts made by these men each day without the least hope of getting not only help but even understanding by so many indoctrinated know-alls, devoted to nitpicking doubts from the comfort of their armchairs. For Facerias to rob banks in Spain was one thing, but for him to have the nerve to do the same thing in Italy to the damage of the Vatican Bank, for example, was different. Of course, one could always gloss over it with the thought that his ultimate aim was always anti-fascism, but I don’t believe that many saw this activity favourably in Italy apart from a few comrades who have never shut their eyes to the real problems of the revolutionary clash. On the other hand, it does not appear there were many who saw no difference between between Spanish banks and Italian ones, concluding that the struggle against Spanish fascism was to begin and carry on with the struggle against all States and all national capital, in the name of freedom, not in the name of the substitution of a fascist regime with a democratic one. The Spanish equivocation demonstrates with great clarity today so many years later, how it was possible at that time to find comrades prepared to involve themselves in armed struggle, but anything but prepared to agree that this struggle spread in a truly anarchist sense, i.e. beyond the immediate objective of first Spanish fascism, then the Greek form, and so on. In recent times many of those so-called comrades in struggle lost no time in declaring their unavailability to support any concept of struggle which did not limit itself to being against this or that fascism but tried to analyse and therefore strike the very expression of power as it was changing and manifesting itself historically throughout the years. In this case, there no longer being the alibi of fascism which always sounded like a moral alibi, many let themselves be overcome by doubt and often ended up asking themselves if there was really a time to attack and if there was not another way to carry out the political struggle against power, a struggle if which if not exactly reformist was at least capable of taking account of the repressive degrees which a democracy is basically always capable of proposing to its opposers. And many of these doubters became and and still are, the flag-wavers of the struggle of Facerias, Sabate and many others precisely because they want to wrap their struggle up in a nice book and relegate it to the long list of those who knew how to sacrifice themselves in the war against fascism, a lost war but one which could also have been won. Our reading of this book dedicated to Facerias, just like the preceding one which Tellez dedicated to Sabate, is different. These comrades were anarchists and revolutionaries, not just generic antifascists. For them the struggle against francoism was just a starting point, and the defeat of fascism would have been anything but a conclusion of that struggle. They would never stated that with democracy in power there was no reason to continue the struggle, they would simply have singled out the new enemies and continued to strike them. And why be surprised? What other role could anarchists have?